LiVEART.US, independent Performance Art initiative hosted at the Queens Museum, continues with its Fall 2018 season with the presentation of the program “The Weight of Inheritance” featuring the work of artists whose work challenge physical, psychological, and geographical boundaries. KLEDIA SPIRO (Albania-United States), OSCAR GAVILAN ORTIZ (Chile), and HECTOR CANONGE (Argentina-United States). LiVEART.US is platform established to support and feature works by local, national, and international artists working in Performance Art and its diverse manifestations. Created and organized by interdisciplinary artist, Hector Canonge, LiVEART.US features works where the body, as main instrument for artistic creation and expression, is the catalyst for sensorial experiences, cultural interpretation, and critical reflection. The program’s main objective is to further support the creation and presentation of new works in Live Action Art in an environment suitable for reflection and dialogue. LiVEART.US follows and complements the monthly program TALKaCTIVE initiated by Canonge in September 2015. Since its inception in 2016, LiVEART.US has presented the work of artists from diverse cultural backgrounds, ages, gender, and national origin creating a dynamic structure and an international network for the exploration, experimentation and execution of Live Art practices. 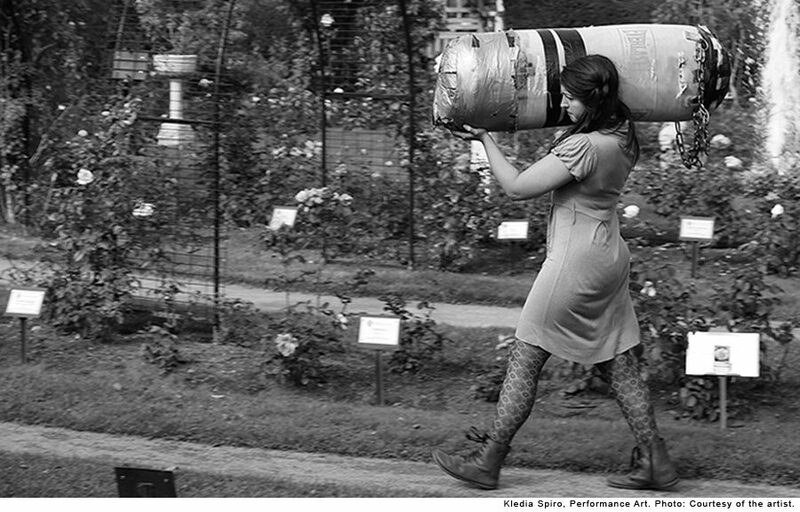 KLEDIA SPIRO creates videos, performances, installations, and paintings. Born in Albania, she was a member of an Olympic weightlifting team. She uses weightlifting as a symbol of survival, empowerment, celebration, and as a vehicle for discussing women’s roles in society, immigration, and times of war. Spiro has performed in New York at the Queens Museum, Songs for Presidents Gallery, Grace Exhibition Space, Rosekill, Panoply Performance Lab, Java Studios, Le Petit Versailles and in Boston at the Isabella Stewart Gardner Museum, Mobius, Piano Craft Gallery, Bathaus, Distler Performance Hall, and the New England Conservatory. Spiro has exhibited nationally, most notably at the Museum of Fine Arts, Boston; Queens Museum, NY; SAIC Sullivan Galleries, Chicago; Museum of Art, University of New Hampshire; and the ProArts Gallery in Oakland, CA. Spiro explores the connection between strength, weightlifting and daily life as a new celebratory ritual for understanding the relationship between the artist and her parents, as well as the present and the past. Her works are based on Freudian and Piagetian behavioral concepts: visions that reflect psycho-analysis, behavioral psychology, and a sensation of indisputability, combined with details of odd, eccentric, absurd, totemic and humoristic elements. Spiro received her MFA from the School of the Museum of Fine Arts at Tufts University. She has a BA from the College of the Holy Cross in Studio Art and Psychology with an Asian Studies Concentration. OSCAR GAVILAN ORTIZ trained as an actor and specialized in theater management and cultural management. He is currently a Professor of Philosophy at the University of Concepción, Chile. Since 1997 he trained and worked as an actor and theater producer in theater companies in the coal basin and the province of Arauco in Chile. From 2007 to 2014 he created CASERIO as a platform for production, mediation, and management of contemporary art and culture, and since 2015 he has directed UNLIMITED—a platform for cultural management. He now serves as the Director of the Department of Culture and Identities for the Municipality of Quilicura in Santiago, Chile. Since 2011, he has carried out a theoretical-performative investigation of the mutilated bodies that are a byproduct of modern industry, while challenging notions of normality and patrimony. Gavilán’s practice proposes a visual-corporeal rewriting of the history of the mutilated bodies that have been displaced in Latin America’s post-industrial cities. He has presented his works in festivals, laboratories, and actions/ art performance meetings in Spain, Morocco, Mexico, Argentina, Brazil, Chile, and Canada. In 2016, he directed AC + C, the first international laboratory of Art and Community Art in Santiago de Chile. He recently directed and participated in the transdisciplinary investigation “TOSCA o la roca estéril antes del carbón” (TOSCA or the Sterile Rock before Coal)—a performance that joined theater, contemporary dance, music and performance art in a project that was realized in Concepción, Chile.He’s been the recipient of awards such as the INNOVA Bío Bío, OEA, and MACHAV (for the first Latin American laboratory of Innovation and creativity in Querétaro, México). HECTOR CANONGE (Founder and director of LiVEART.US) is an interdisciplinary artist, independent curator, and cultural entrepreneur based in New York City. His work incorporates the use of new media technologies, cinematic narratives, Live Action Art, and Social Practice to explore and treat issues related to constructions of identity, gender roles, and the politics of migration. 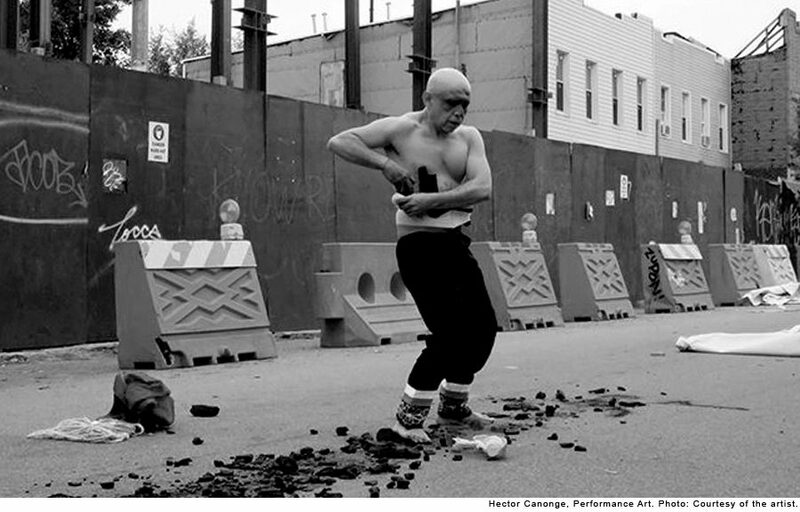 Challenging the white box settings of a gallery or a museum, or intervening directly in public spaces, his performances mediate movement, endurance, and ritualistic processes. Some of his actions and carefully choreographed performances involve collaborating with other artists and interacting with audiences. His installations, interactive platforms, and performance art work have been exhibited and presented in the United States, Latin America, Europe and Asia. 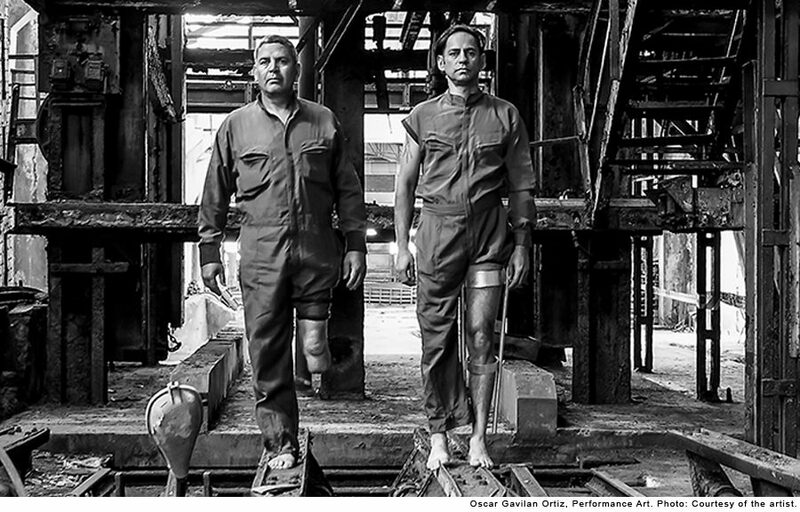 As cultural entrepreneur, Canonge created and runs the annual Performance Art Festival, ITINERANT, started ARTerial Performance Lab (APLAB), an transcontinental initiative to foster collaboration among performance artists from the Americas, and directs his independent programs: PERFORMEANDO, a program that focuses on featuring Hispanic performance artists living in the United States and Europe, PERFORMAXIS, an international residency program in collaboration with galleries and art spaces in Latin America. After living most of his life in the United States, Canonge returned to South America in 2012, and lived abroad for almost 3 years. The artist returned to New York City in late 2015 to continue with the development and execution of new projects, exhibitions, and initiatives among them: TALKaCTIVE, LiVEART.US, and CONVIVIR the international residency program at MODULO 715. In 2017, Canonge organized the performance art platform, NEXUS, premiered during Miami Art Basel, and worked in the development of the first International Performance Art Festival of Santa Cruz de la Sierra, presented in January 2018 in Bolivia. The artist is currently at work in a project for upcoming presentations in the United States and India.